I did pretty good with the book reading/listening again this month! Once I started Gone Girl, I couldn't put it down. I blasted through the second half of the book in one day. 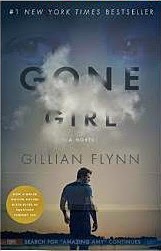 I will definitely be reading more of Gillian Flynn's books in the future. So good. I also read The Great Gatsby. 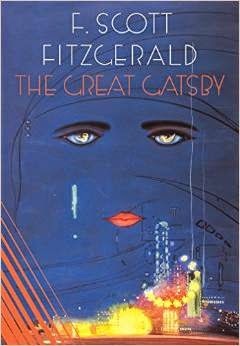 Why The Great Gatsby? That's not the typical kind of book I've been reading! A few weeks ago I was cleaning the book shelves in our living room and I was looking at all these books I still have from high school and college. And I'm not even going to lie about it - a lot of them I never read. I was very good at faking my way through the English classes in my academic career. :) Anyway, I decided that this year I would like to read a few that I was assigned and never actually read or finished, along with some of the books that are typically assigned in school but for whatever reason weren't required reading for my classes. I think it will be a fun little challenge! As for audiobooks, with the solo drive to Fargo last week, I listened to a book on the way there and another book on the way home. It definitely helped pass the time! 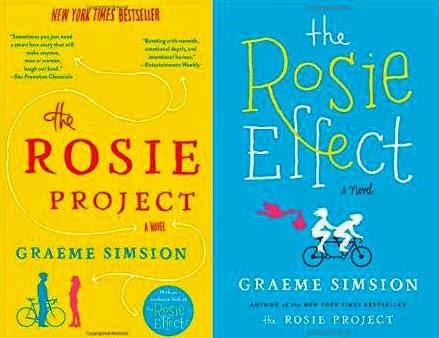 I picked The Rosie Project because the audiobook was pretty short (around 8 hours) so I knew I could probably listen to the whole thing in the car. I LOVED it! So much so that I decided that for the drive home I had to listen to the next book in the series, The Rosie Effect. I highly recommend these books. They were sweet and funny and made for easy listening. I'm doing pretty good on my reading challenge of reading/listening to 50 books in 2015. I'm up to 9 for the year already! What have you been reading? I want to hear about it! Wonder what I read/watched last month? Check out this blog post. Saffron is knit from the top-down. 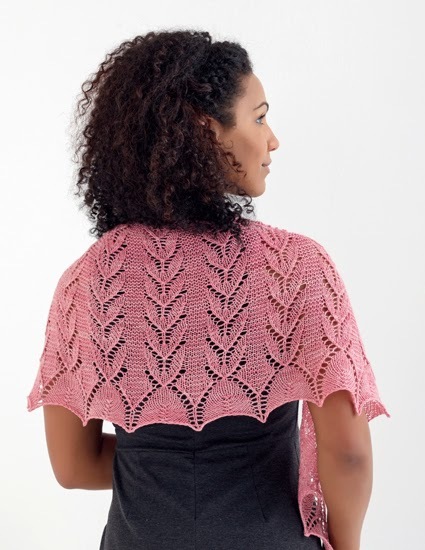 You start working the shawl as a half-circle shawl, then switch to a wedge construction, similar to a top-down triangle shawl. I love this shape - there's so many ways you can wear it! Like Bandwagon, you can buy it as an individual pattern, or get the eBook, which is discounted until the third pattern comes out in early March. 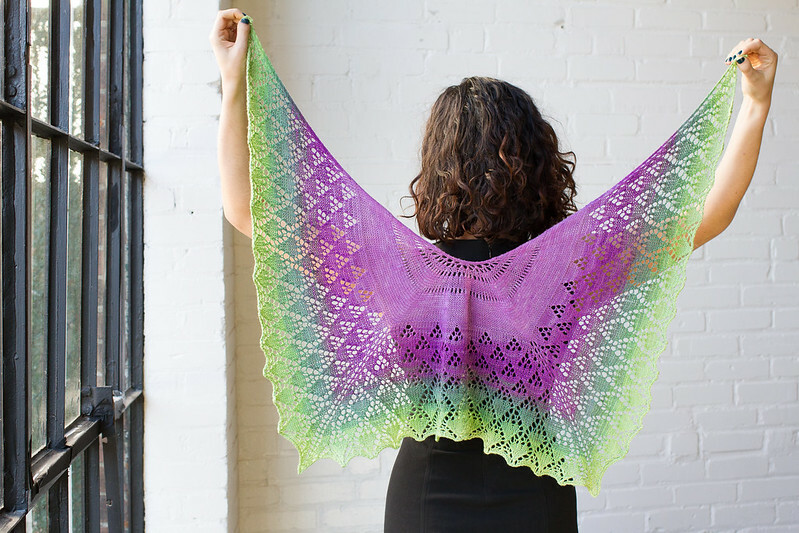 I designed this shawl so that the charts can be repeated until you run out of yarn. The final chart in the pattern could be stopped at 4 different spots and would still make a great looking edge. Perfect for when you have that precious ball of gradient yarn and you want to use it all. 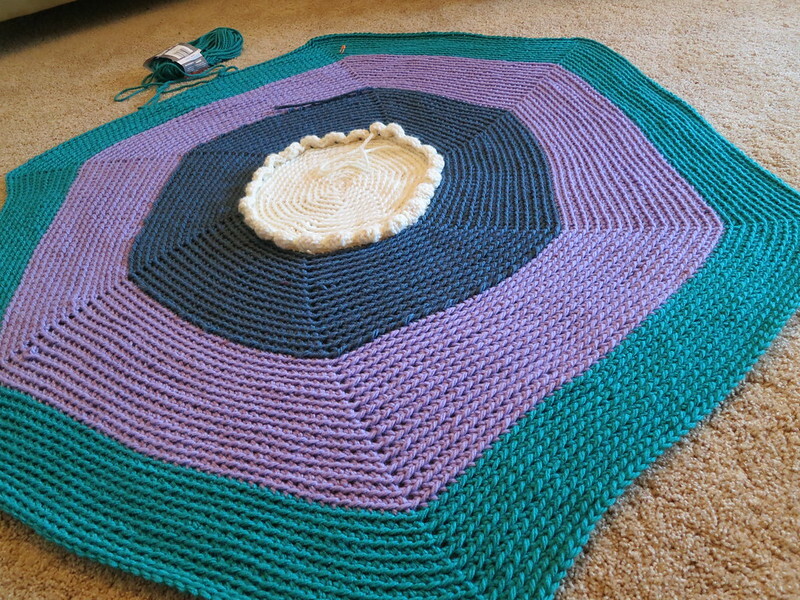 For this shawl I used Twisted Fiber Art Muse - that's definitely a yarn I want to use up! Hope you enjoy this next shawl in the collection! There's 4 more to come, so stay tuned. I am having so much fun working on this blanket. It's easy enough that I can watch tv or listen to a book while working on it. A win for me! I love the double-crochet "flower petal" detail. I can't wait to add the rest of them. 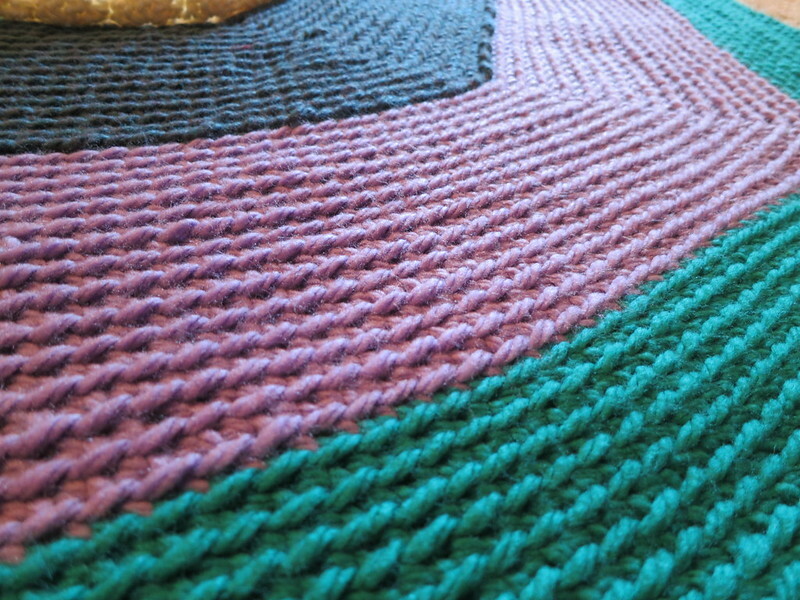 And I love the look of single crochet through the back loop. I've made a couple mods to the pattern, which you can see on my Ravelry project page. The pattern is perfect, but I'm using a thicker yarn for mine so I made a couple changes as a result. 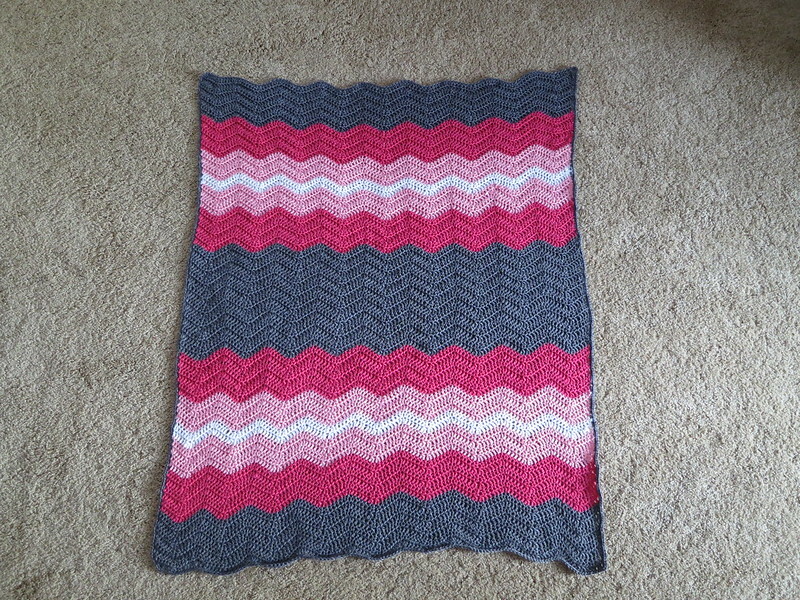 I love this blanket and hope mom and baby will too! Last week, I was in Fargo visiting my brother, sister-on-law and niece. What a great time! I always love going to Fargo. It's a great town and I had a wonderful visit (and it turned out to be a good week to be there...my brother broke his leg in two places the weekend before so I could drive him around and stuff). 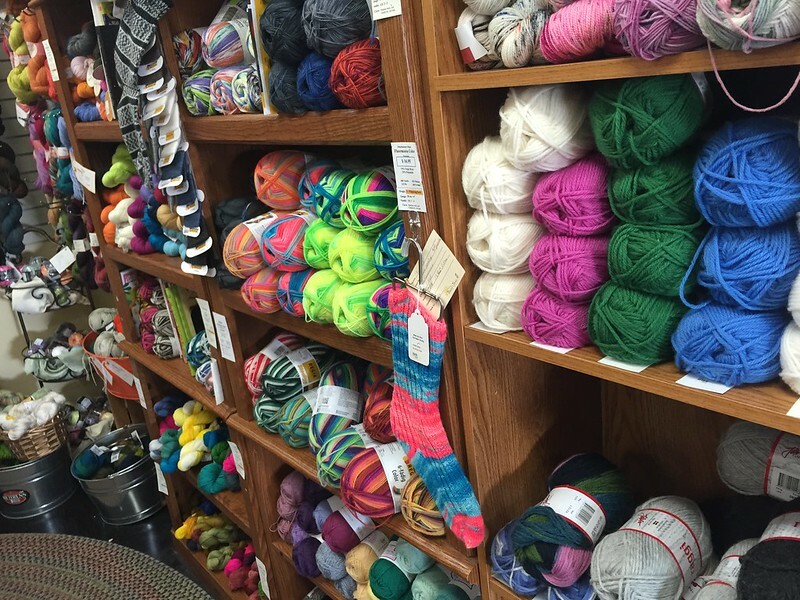 I've been to Fargo a few times, but never had time to check out a yarn shop until this most recent trip. 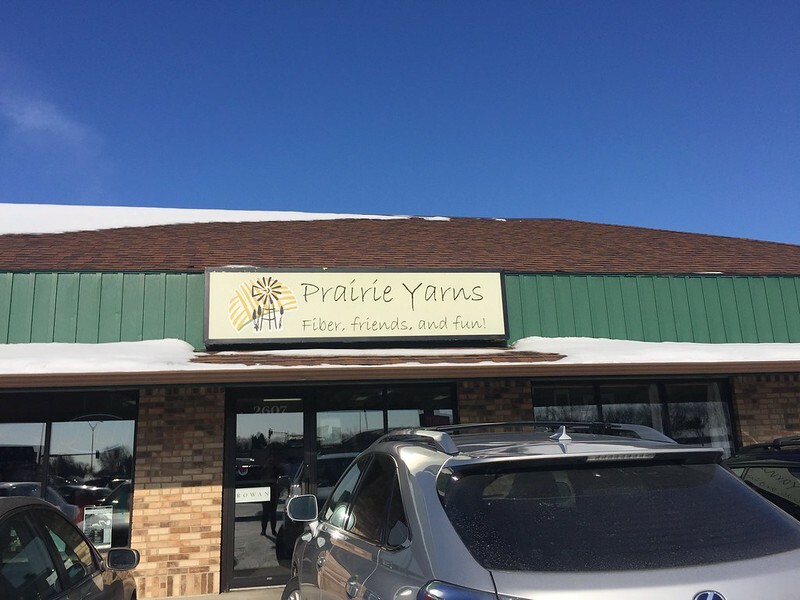 It was suggested to me on Twitter that I visit Prairie Yarns, so I decided that was the one to check out. I was excited to see a large amount of Done Roving yarn there. 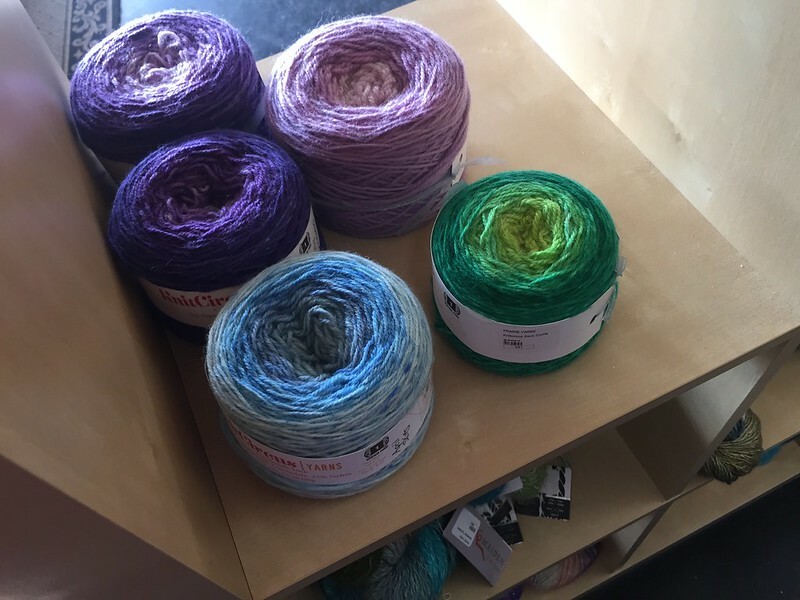 Lots of DK Gradient yarn available for making Beddington shawls! 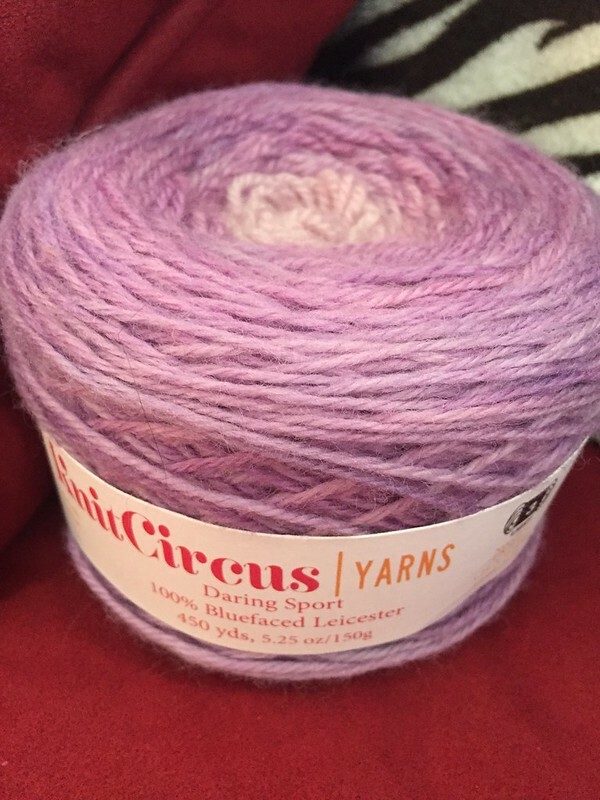 They even had a small quantity of KnitCircus yarn. Of course I had to pick one to take home with me! I'll be back in Fargo next month for my niece's first birthday. I hope I have time to stop into Prairie Yarns again! Do you live in the Fargo/Moorhead area? 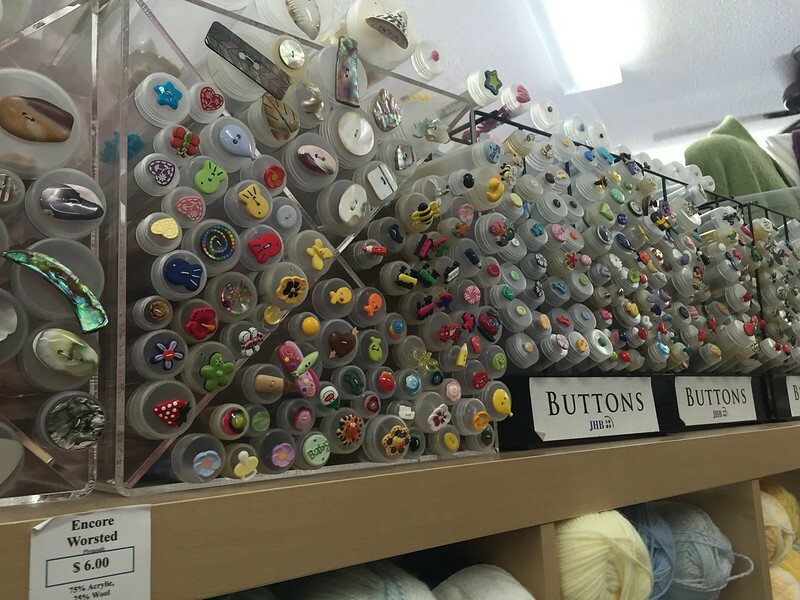 Do you have a favorite shop in the area? Last November, when my brother told me that my niece, Roz, really wanted another blanket from Auntie Jen for Christmas I was so excited! 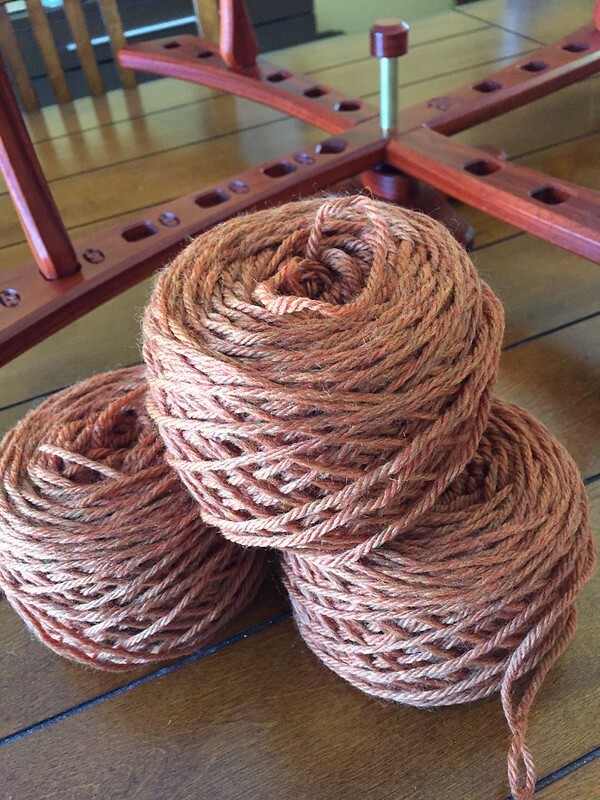 I ordered some Brava Worsted from Knit Picks and was ready to get started. Except I didn't. Things got a little crazy and I didn't work on the blanket and it wasn't ready for Christmas. Bad Auntie. Fortunately, Roz is only 11 months old now, so she didn't know. :) Anyway, I've been up in Fargo this week for a visit so I knew I wanted to bring the finished blanket with me. And, maybe it sort of worked out....the blanket is very "Valentines-y." 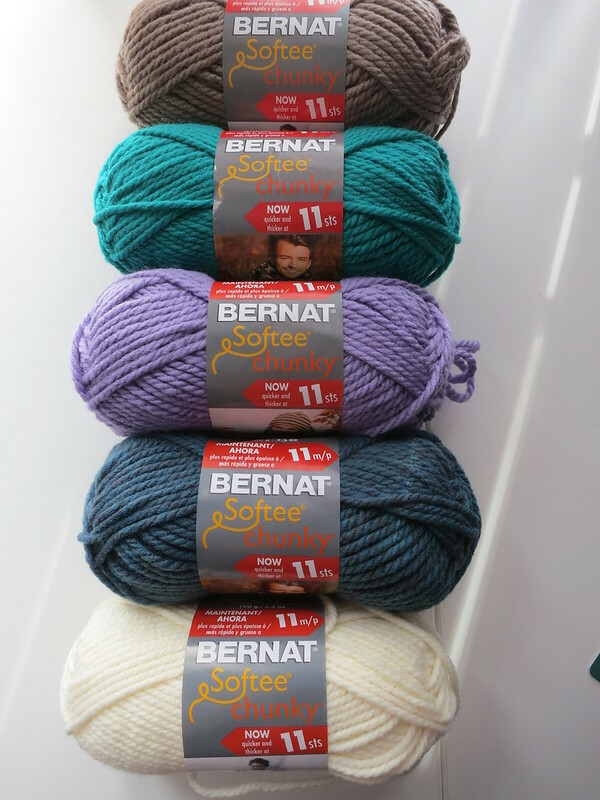 I originally bought the yarn with a different blanket it mind - one that was done in intarsia. 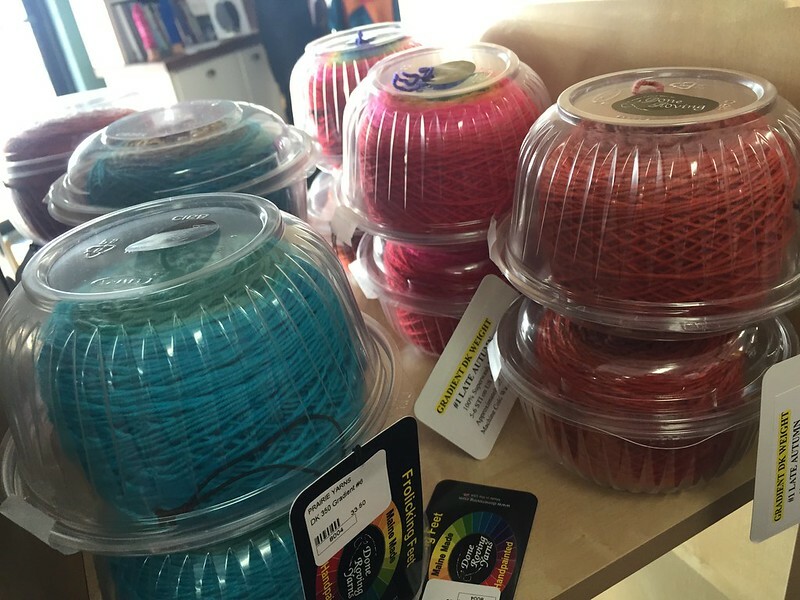 But, the thought of handling several balls of yarn at once scared me away. So, I decided to go with a classic ripple and used the Neat Ripple Pattern instead. I predetermined how I was going to add the stripes based on the amount of yarn I had of each color. 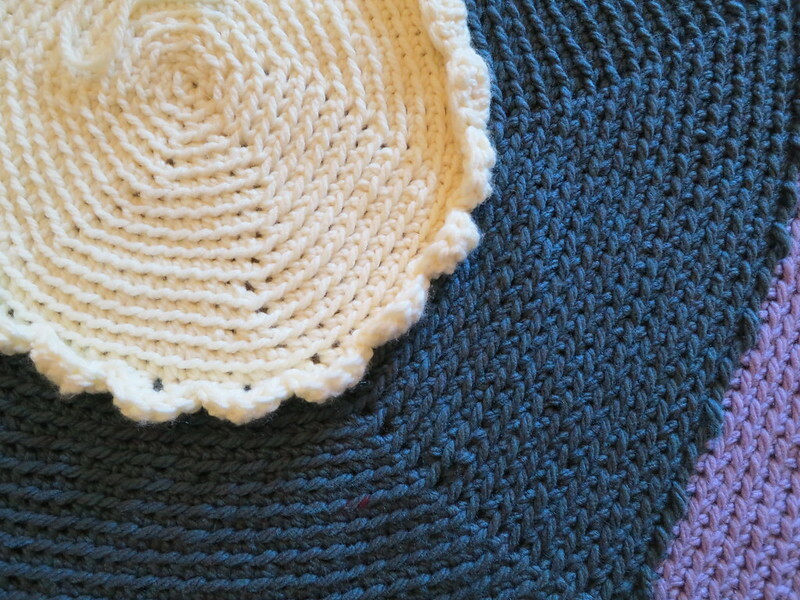 You can see the sequence on my Ravelry project page. I love this blanket. It was so very fun to work on. I definitely will be making another one in the future. I'm thinking maybe one in Chicago Bulls colors for my Bulls-loving mother-in-law. Do you crochet? 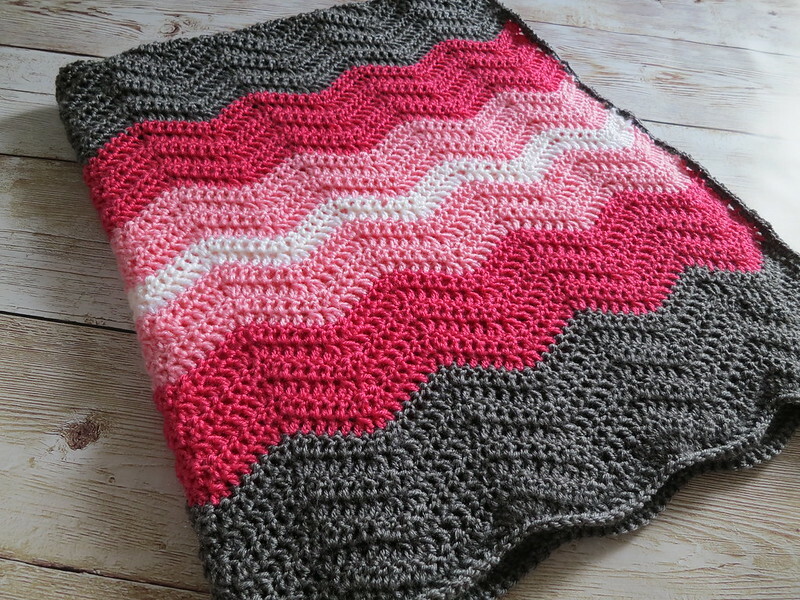 Do you have a go-to blanket pattern? I want to hear about it! I hope mom and baby enjoy these new hats! 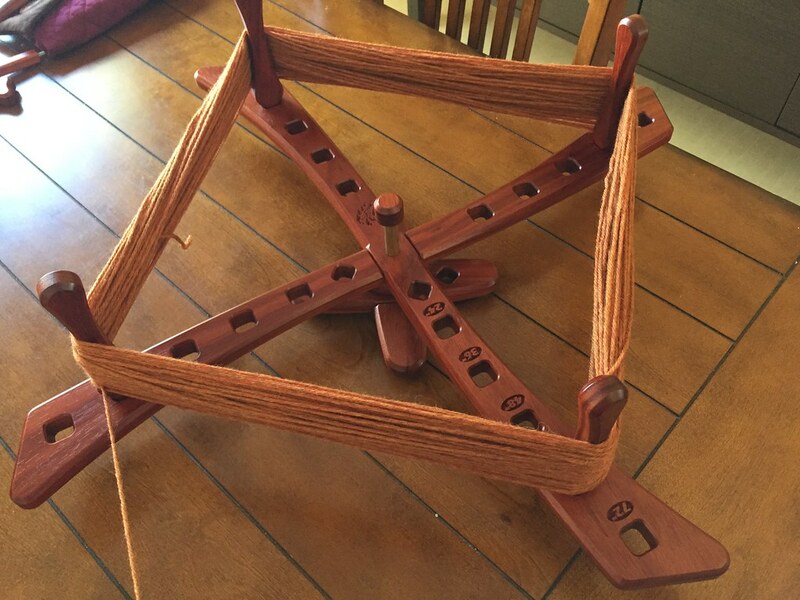 A few months back I hit up Twitter and told the Twitter knitters I was looking for a new yarn swift. I received a suggestion to look into Hornshaw Wood Works. The swifts cost more than what I have spent in the past so at first I wasn't sure if I wanted one. But then I started thinking about it. I have long been fighting with my inexpensive swifts. Whether it was a table-top or umbrella swift, after awhile things start to breakdown. It was why I was in the market again for yet another one. Sometimes it's better to spend a little more if it's going to last, you know? Hornshaw had good reviews so I went for it. And I'm so glad I did. I have been using this swift for months now with absolutely no problems. Winding yarn used to mean me stringing together every expletive I know in various combinations. 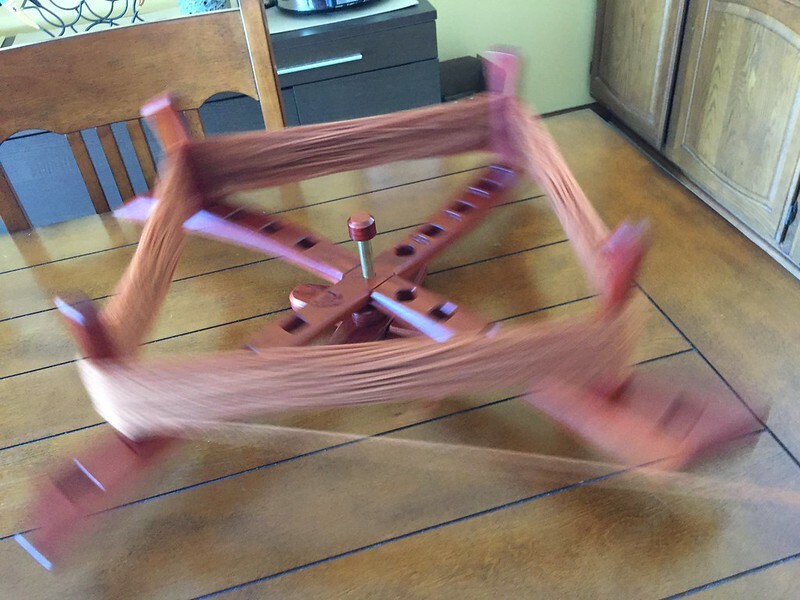 I actually like winding my yarn now! 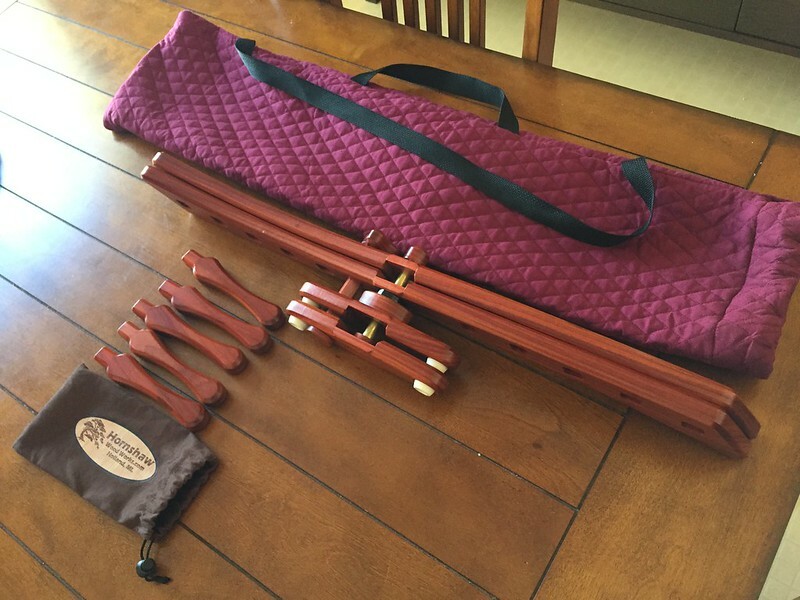 The one I purchased is the Padauk yarn swift. I love the color! I also purchased the swift bag to keep everything together. I really like how the swift folds flat with the handmade screw to keep it in place. 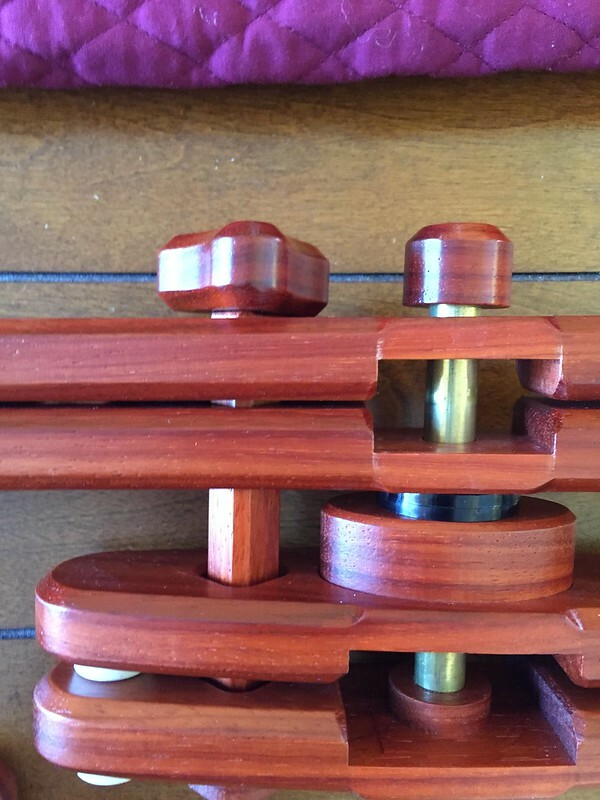 It comes with the adjustable pegs so your yarn will fit on it just right. I'm glad I finally have a swift that I know I will be able to use for years and years to come! When I was working in the lab, I was the queen of checklists. I had one coworker who could remember everything in his head. Not me. I had a daily checklist of reports to send, bottles to prep, tests to do. 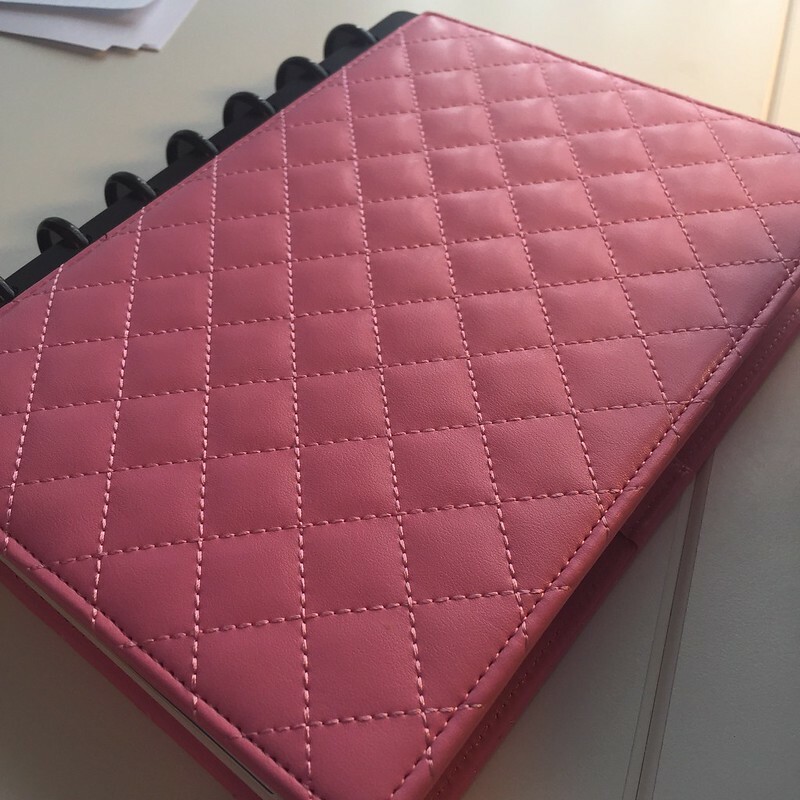 But when it came to my design business, there were no checklists. When I would release a new pattern I would try to remember everything I had to do or wanted to do and, of course, things got missed all the time. 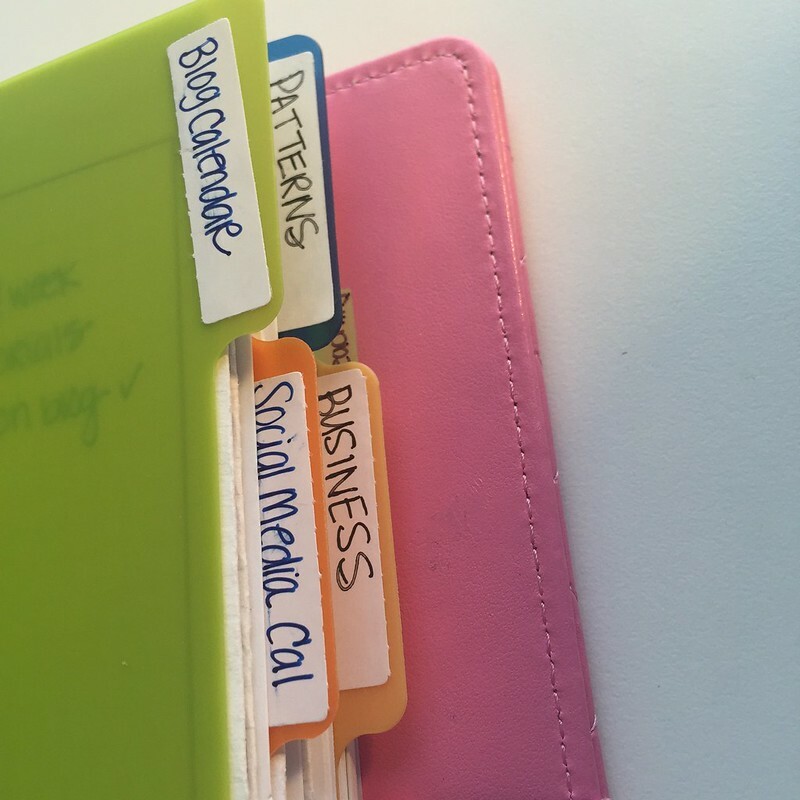 When I left my lab job last April, I started forming some checklists for the business, but it really came together after reading this post from Tara Swiger. 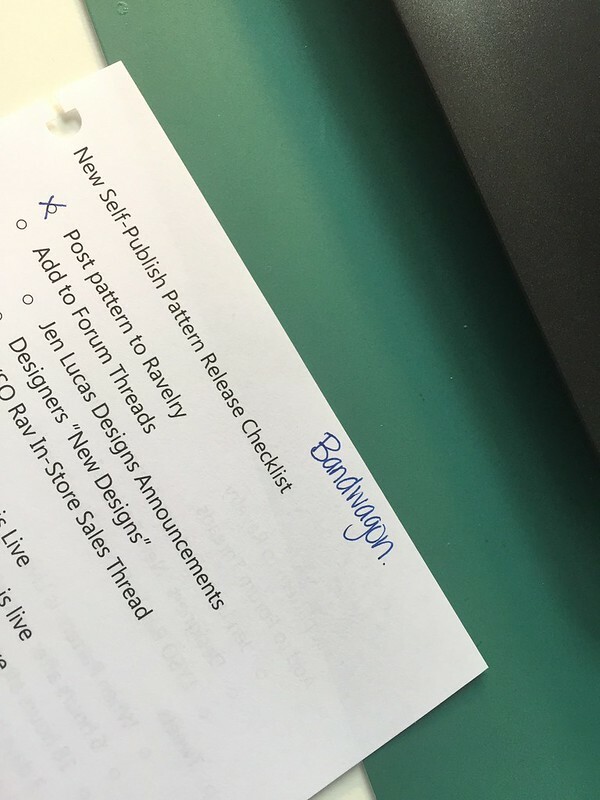 After reading that, the pattern release checklist was formed! My new pattern checklist has been a total lifesaver. While it's always evolving and I'm finding ways to make it better, it saves me from having to think - which I like. :) Just follow the checklist and everything will get done! I allow myself some wiggle room on the social media stuff. Because I have other things going on besides the self-publishing, I might already have something scheduled to post that day, so I just adjust a bit as necessary. I like to have things scheduled, but I don't want too many things on one day. That's it! Are you a designer? 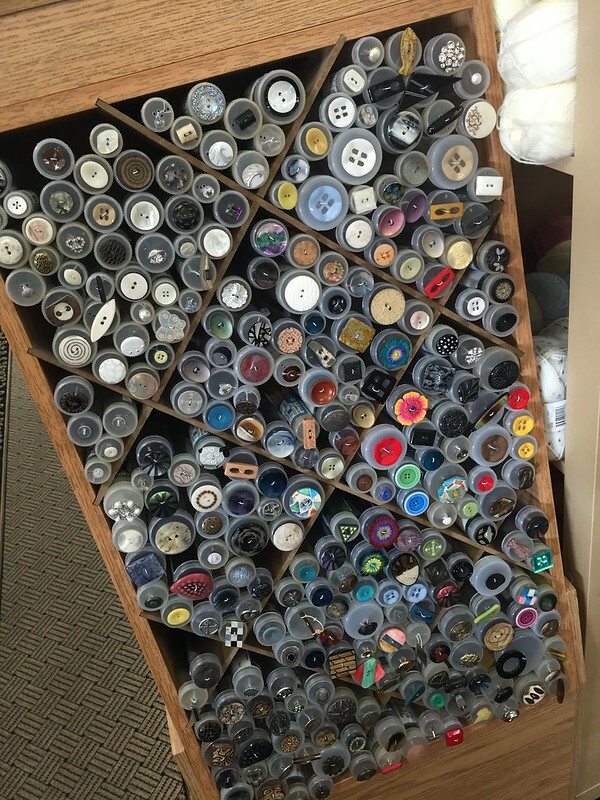 Is there anything else you add to your pattern checklist? If you're a designer or blogger who wants a checklist, I hope this helps you develop one of your own. I have a confession. 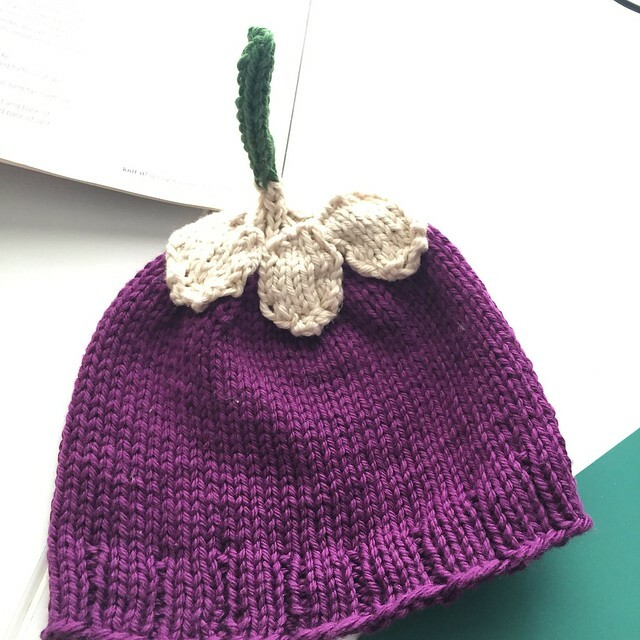 I'm addicted to knitting Upside-Down Daisy hats for babies. It's a problem. Don't believe me? Let's take a look at the evidence. I blogged about this hat here and here and here and here. I think there might be one that I made but didn't blog about based on my Ravelry project pages. I've been trying realllly hard to knit from the stash lately. 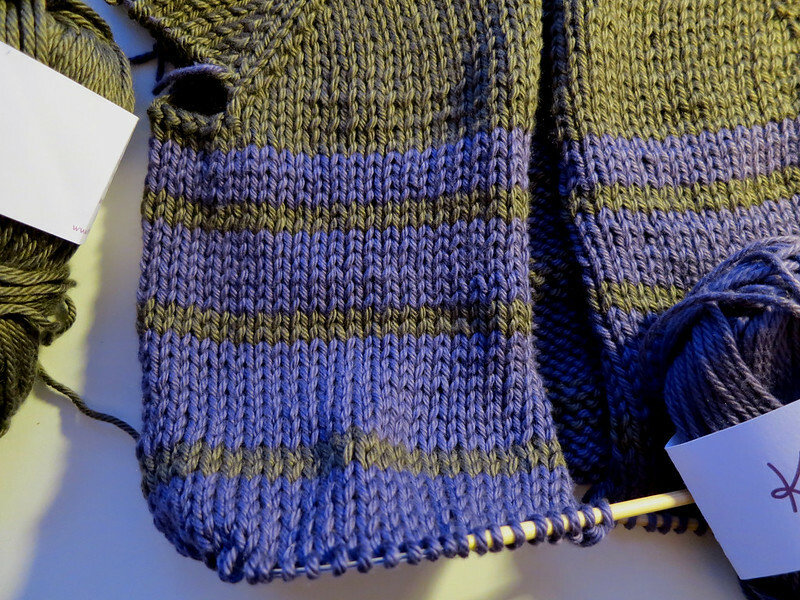 I didn't have enough of one color in the bin of random Knit Picks yarn to do a whole sweater, so I decided that the sweater should have stripes and got knitting! I'm adding two more rows to each purple stripe as I work down. My plan it to do the same thing on the sleeves when I get to them. I'm hoping I'll have enough to do the collar in brown. We'll see. It's an adventure! I've made this sweater pattern before, but there's no record of it on the blog or in my Ravelry project page, but I swear, it happened. 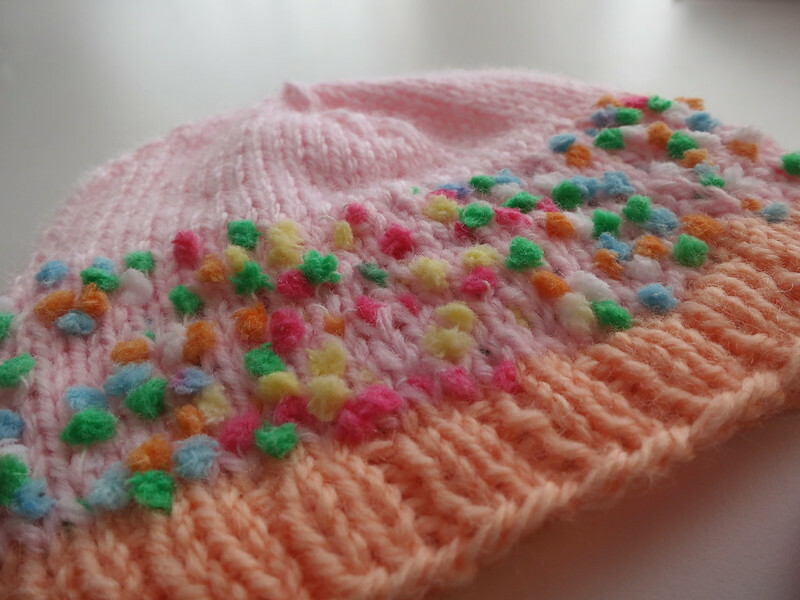 It's so cute and easy and fun to knit that making another one just seemed right. I'm hoping to also make my standard Upside-Down Daisy hat as well. Because all baby girls need one! Over the last several months, I've been working on a new shawl collection. I'm so excited about this one. 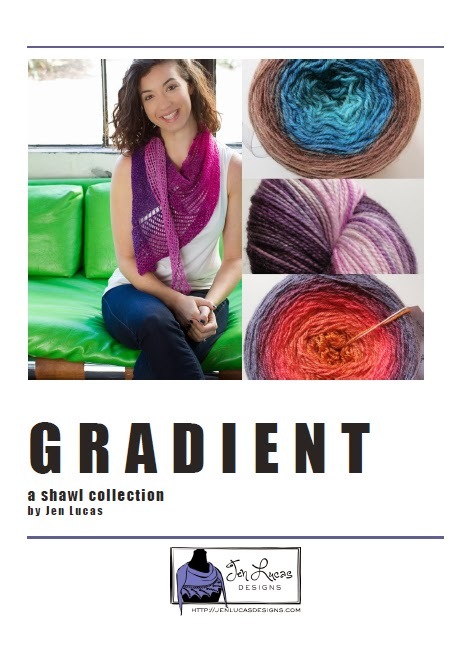 Welcome to Gradient: A Shawl Collection. 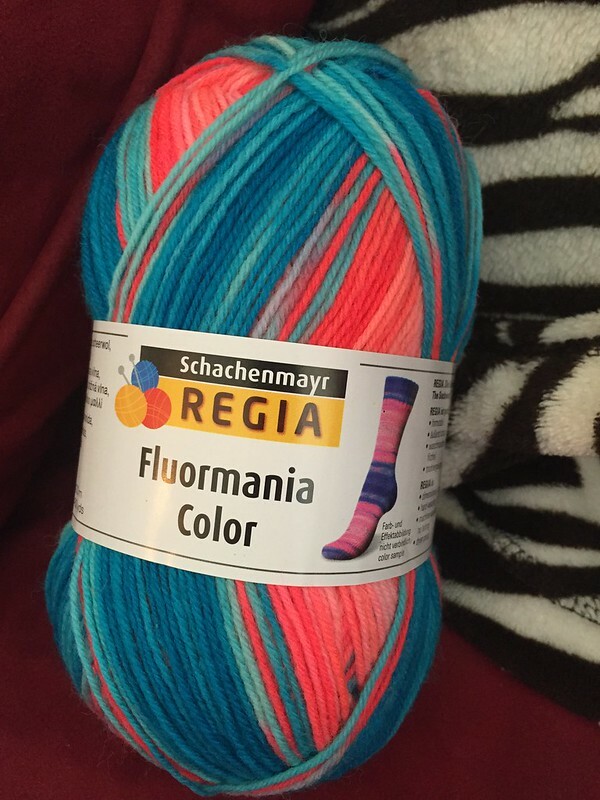 Here's the story behind this one: I bought some KnitCircus Opulence Sock while at Stitches Midwest last year. And while at Stitches that weekend I started the shawl. And finished the shawl. And loved the shawl. Bandwagon is a very fun knit. You start with just 3 stitches and then increase while working the lace mesh pattern. You then continue increasing while the mesh slowly gets "eaten up" by the garter stitch section. Eventually you start decreasing to get back down to 3 stitches. A fun triangle construction! I talked to the wonderful people at Stitchcraft Marketing and set up a photo shoot with Caro Sheridan for the whole collection. Caro and Mari did an amazing job with the styling and photos! The eBook is currently available for just $7.50. As I add each pattern, the price of the eBook will go up, until it's at the final price of $12.50. So buying it early will save you a bunch of money! Each pattern is available individually as well. So get one, get them all, it's up to you! 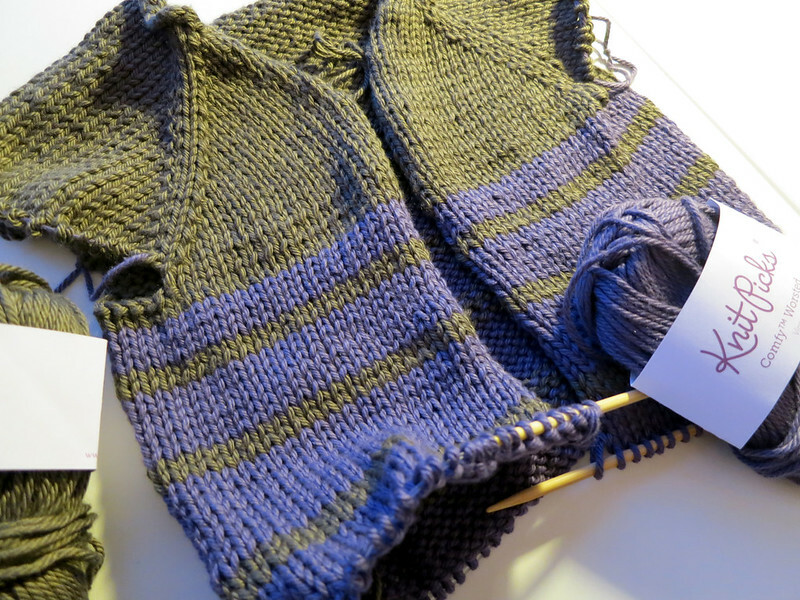 On February 1st, we started the Sock-Yarn Shawls II KAL in my Ravelry group. It's so fun to see what everyone is picking to make. I've decided that I'm going to make a Monarda. It's my favorite shawl in the book and I just have to have a second one! The pattern includes notes on how to make it larger, which I plan to do. I'm using two skeins of Fiberstory Glow Sock that I picked up at Stitches Midwest last year. 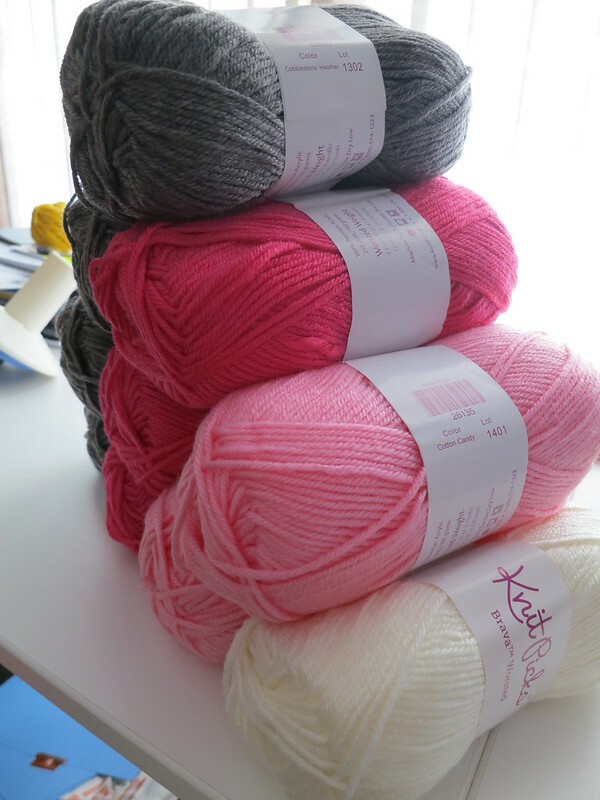 I'm excited to see how it knits up! If you haven't joined in the fun yet, hop on over to the Ravelry group and check out the KAL. There's prizes to be won! pawlah on Ravelry! Congrats! 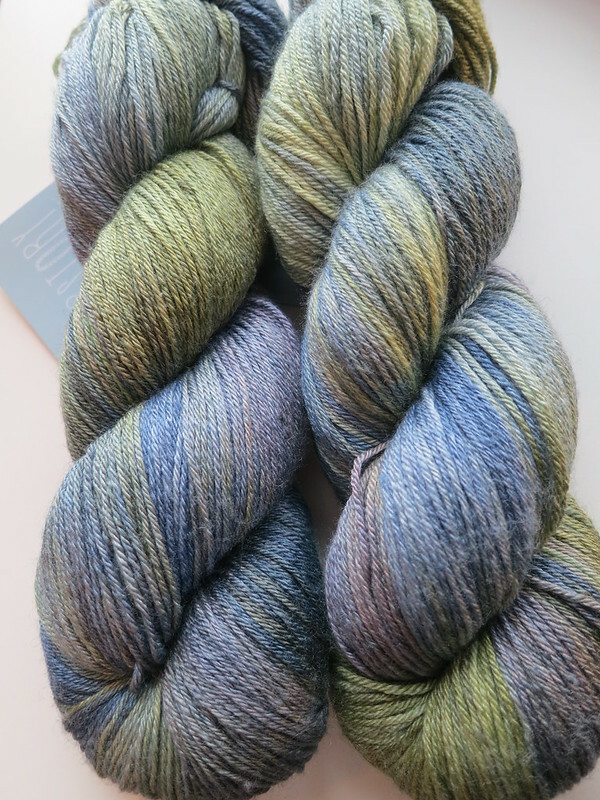 Please check your Ravelry messages so I can get your address to send you the lovely Done Roving Yarns Frolicking Feet DK Gradients. Hope everyone has a good weekend and finds time for a little knitting. 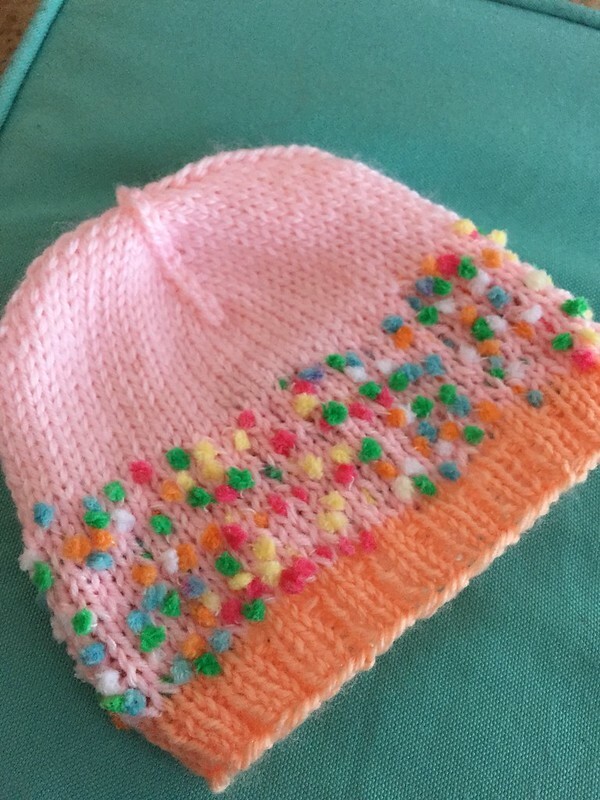 I'll be working on some baby hats. 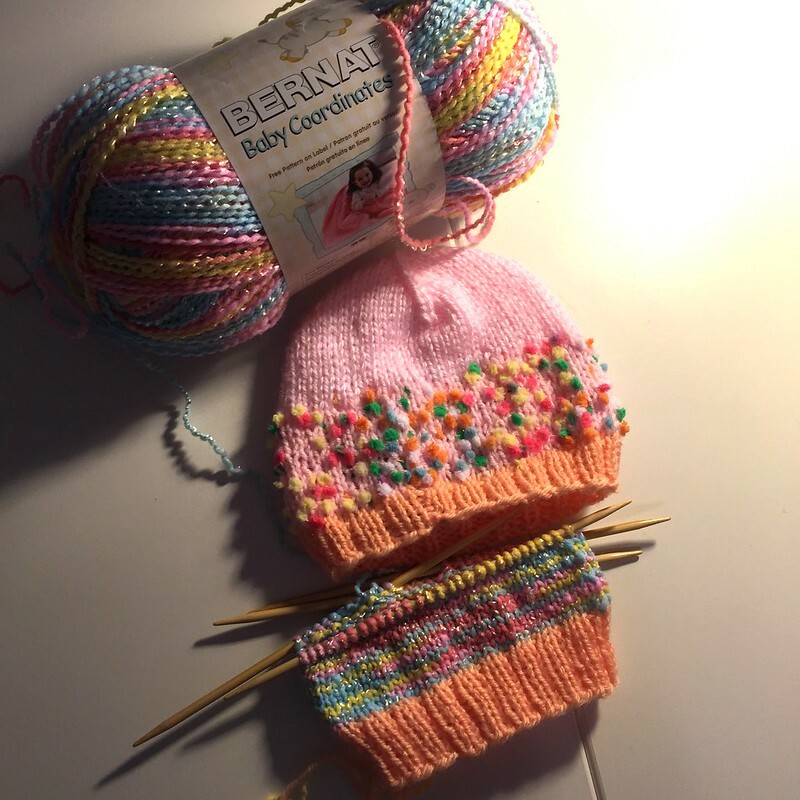 I've received an emergency request for a preemie hat from a friend (ok, not really an emergency but she's new mom with a baby born a few weeks early and cannot locate the hand-knit hat they received in the hospital. She asked if I could make something similar because she really loved it) . 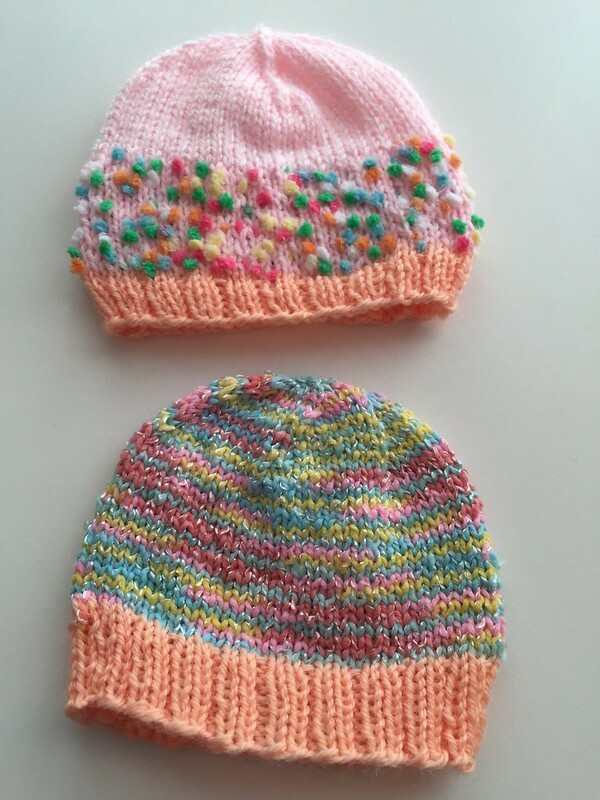 Just one hat, but of course you can't stop at one when it comes to adorable baby knits. There's lots of ways that you can find out about how to submit to magazines. For most knitting and crochet magazines, if you go to their websites, you can usually find information on how to submit (or where to sign up for email notifications for submission calls). Some magazines will take submissions for anything at any time and other ones have a schedule and a theme and you'll need to get your submission in by a certain date. Interweave Knits works the second way. They both put out a call for submissions with story/theme information as well as the date the submission is due. They want physical submissions instead of email submissions, so keeping track of the due date is key! You need to make sure your submission arrives on or before that date. 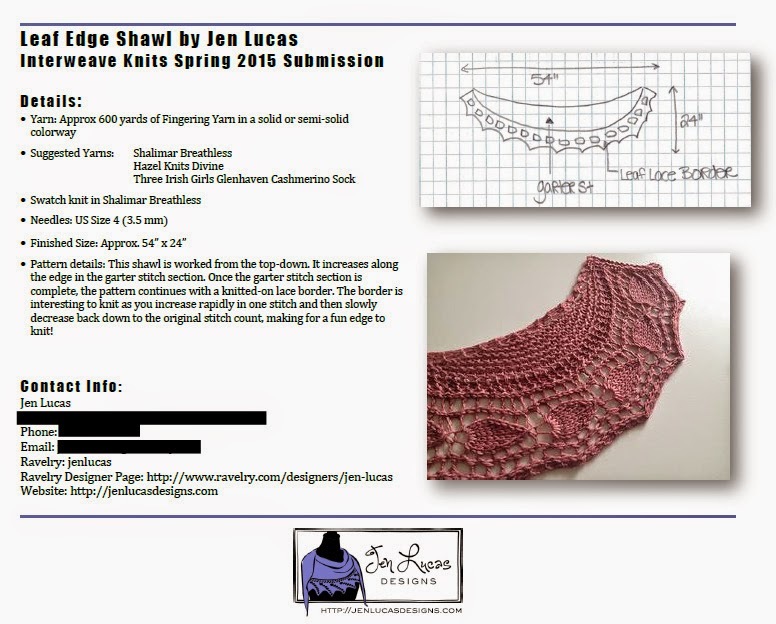 So when Interweave Knits is ready to post a call, they do so on their website. They also may post in the Designer Group on Ravelry. I can't remember where I saw the call now, but it was one of those two places. This particular call for submissions talked about the four different story ideas. One of them was the Perpendicular story, where the editors were looking for projects with knitted-on borders. I love those borders so I decided to submit! So, what if your design doesn't get accepted? It's OK!! I've said it before but I'll say it again: as a designer you have to get used to rejection. I've had wayyyy more design rejections than designs accepted for publication. It's possible they are about to publish something similar that you (obviously) don't know about, or it just doesn't quite fit into the theme with the other designs. Once you get your swatch back and you know you have been officially rejected, you can do what you like with your design idea. See a call for another magazine where it could work? Go for it! Want to self-publish it? Great! Just make sure that you aren't submitting the same idea to more than one publication at a time. That is a huge no-no! Just be patient and wait and if your pattern gets accepted or denied. If it does get rejected, think about if there's anything you can do to make it even more awesome than it already is and move forward!